Alyssum Mountain Gold Alyssum Montanum is a low growing perennial. This Alyssum forms a low, trailing mound of silvery-grey foliage and blooms with masses of bright-yellow, fragrant flowers from mid spring until late summer. Alyssum Montanum is easy to grow from Alyssum seeds. The germination is fast, and this perennial Alyssum establishes itself quickly even when the seeds are sown directly outdoors in spring. It is recommended to clip Alyssum plants lightly after blooming to maintain a bushy habit. 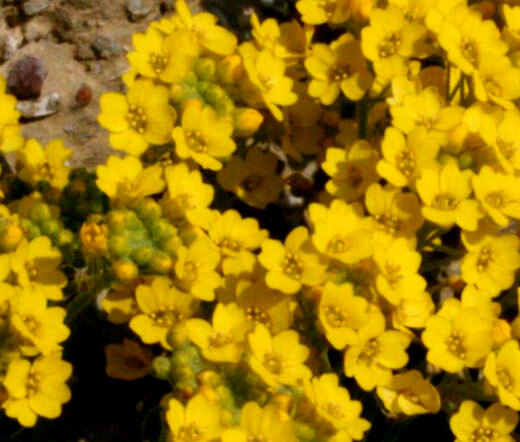 Alyssum Mountain Gold adds a lot of yellow color to rock gardens spilling over rock edges, or cascading down rock walls, and Alyssum makes a very attractive, evergreen perennial ground cover. Alyssum Montanum likes to grow in full sun, and moist, but well drained soil. The established Alyssum is extremely drought tolerant.